I’m very fortunate I am able to spend time in an area of Quebec called the Eastern Townships, or les Cantons de l’Est (and now becoming l’Estrie). The region is special in a number of ways; however one particular aspect of it would make me continue to spend time there even if it were situated in the ninth circle of Hell. The food. While the grocery stores are similar enough to what I see in New York (other than everything being labeled in French), the Eastern Townships happens to be an area of agriculture and animal husbandry, and due to that, much of the food we eat is grown or produced locally. Very locally. It is “slow food” at its best. 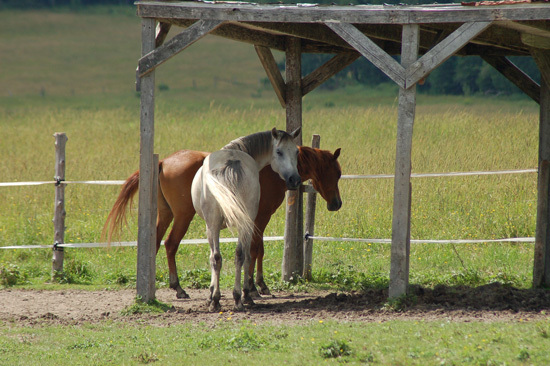 It is a place of lakes and hills (and a few ski mountains too), farms and pastures, fruit and dairy. 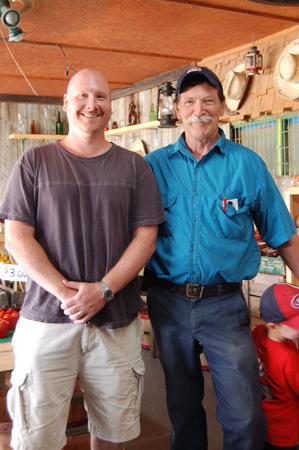 The Cantons has always been a place deeply rooted in working the land, and the culture has encouraged the growth of small businesses which sell their produce scarcely feet (or meters) from where it was grown. Your raspberries may have been picked this morning and your eggs just descended from the bird (that may sound gross, but if you have ever eaten an egg laid the same morning, you won’t ever want to eat a supermarket egg again, it is a different product altogether). While I go to the store for paper towels, for my fruit, vegetables, eggs and even meat, I jaunt a few minutes down to the road to pick up food for lunch or dinner; it is in fact more convenient than driving to the store. Meat, eggs, and fruit abound in roadside stalls, more fresh than the competition which has been sitting in a truck for days or weeks. 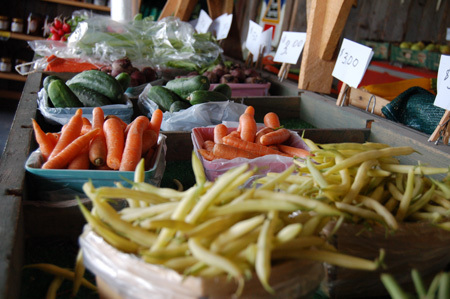 It is the slowest of slow food, not even having journeyed to a farmers market. Vegetables and more fruit are available in small farmer’s stands also along the side of the road, such as one run by Gaston, the friendliest purveyor of local produce I have met. He knows what is being harvested and when, as well as the day he will receive it. He is my local source for the dark, rich maple syrup I stock up on every year, available only to those who ask specifically. The #1 light/clear abounds on every market shelf, being perceived as a better product. However those of us in the know understand that the darker, “lower quality” syrup has more flavor and deep maple tones than the light syrup. 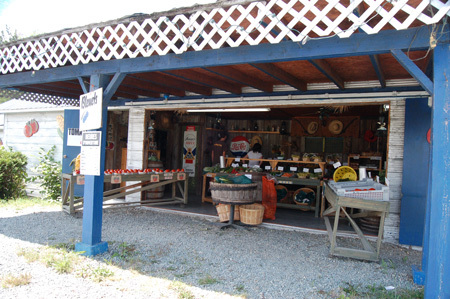 Gaston’s farm stand is the place where all the locals go for fresh produce when the summer bounty screams for attention, and it is easy to eat like a king while spending like a pauper. The Eastern Townships can feel like an island of a century past. A local monastery at Saint-Benoît-du-Lac sells some of the most amazing cheese that I have ever eaten, which they make on premises. 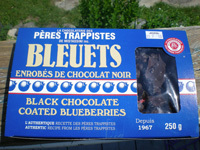 Another group at Abbaye cistercienne de Mistassini sells dark chocolate covered wild blueberries for a few weeks of the year, while in season. The roadside is filled with horses, cows, and sheep (and even a few llamas). Riders on horseback occasionally clop by your house. The days feel slow yet productive. But the food, particularly in the summer, seems the way food ought to be. 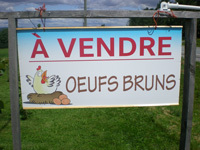 In the eastern Townships, food seems no longer a commodity, but a celebratory aspect of the region. A local Relais & Châteaux, Manoir Hovey, even has an internationally acclaimed restaurant, in which they espouse local cuisine, many ingredients being sourced from within a few kilometers of the hotel (duck from Lac Brome, local raw-milk and artesianal cheeses, and dishes garnished with edible flowers picked from their own garden). The slow food of the Eastern Townships is not slow as a marketing angle, but a natural occurrence resulting from a culture that appreciates what it has. While I do the region a disservice by not mentioning the thousands of examples of local cuisine and produce available, the old-world feel combined with the food craft gives the eastern Townships an ambiance all its own. No place could feel so far from where it really is, and the accessibility and appreciation of locally produced foods is miraculous. There are many places in the world that have a renowned dish or food item, but nothing that I have experienced quite matches the diversity of culinary interest or availability in the eastern Townships of Quebec. 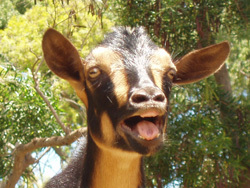 I’ve always had a fondness for goats. They are playful, fascinating creatures, and look rather tasty too. When I’m not feeding them, I’m eating them. While I have never actually cooked a goat, I have ordered it in restaurants a few times, so when the opportunity to purchase some presented itself, I knew it was a challenge that I could not turn down. The other day I was in a conversation with someone and mentioned that I had never cooked goat but that I liked the gaminess of the meat. She mentioned that a tiny, hole-in-the-wall butcher shop in the next town carried it, along with an assortment of meats that are not common to the palates in my area. I knew I had to head there immediately. The shop was spartan, almost comically so. All that I saw in the cooler shelf in front of me were a few cuts of beef that had developed a pellicle, as though they were being dry aged, although I knew that this was far from being the case. Thoughts passed through my mind, should I really be here? Should I be buying meat that could be who knows how old, aging quietly in the back room, and particularly a type of meat that surely does not sell in volume enough to ensure it’s freshness? Dare I? Yes, I dare. “Yes, goat. Do you sell goat?” I asked again. “I’ve never bought goat before, can I ask for certain cuts or how is it sold? Do I have to buy half a goat?” I asked jokingly. He didn’t even smile. “Well, It’s $3 per pound, so we give you a bit of this and a bit of that so you don’t get all the good pieces and leave the bad stuff for everyone else.” He said (little did he know that was fully my intention, but my plan had been foiled). “OK” I said, “I’d like four pounds please. “Well, I may do a curry, so, small pieces, please” I replied. He walked through the cooler door behind him and returned in a few minutes with half a goat. I was momentarily excited before I realized that I had asked for small pieces, and that my wife would not be coming home from work to see me roasting half a goat on a spit in our back yard. Oh well, another time. He took a large knife and started slicing the goat into smaller pieces, which he placed on a table in front of what looked like a giant jigsaw. Covering the table were the remnants of the beef he had been cutting for the woman before me, and these he brushed away with a dark and soiled washcloth which I assumed he used on the floor in the evening as well. The goat, it was nestled all moist and all red, while visions of bacteria danced through my head. The man with his ‘kerchief, and I in my cap, wasn’t quite sure that I wanted that cra… Oh, wait, this is a family show. I watched as he cut the goat into small pieces, making sure I had as much bone and connective tissue as was possible. Half way through the process his cell phone rang, which he proceeded to answer, chatting happily for a few minutes. I imagined the phone teeming with the evidence of the morning’s butchery, and now with extra goat. Sanitary gloves were foreign to this shop, by the way. Not a hand was washed between tasks, nor between meat, and phone, and meat. …Did I still dare? Yes, I was up for the challenge. I took my four pounds of goat and he took my twelve dollars. Whoever got that money next would be carrying goat remnants in their wallet for some time to come. So will I, as will the handle of the bag he handed me, which I diligently took trying not to grimace at the wetness. He didn’t seem to mind, so why should I? My great-great grandfather, along with his brother, started the Armour Meat Packing Company, so meat is in my blood. I therefore assumed, perhaps erroneously, that my cast-iron stomach could survive anything, even ancient chunks of goat; dripping with what I hoped was melt water from the packing ice. I thanked him and walked to my car, just wanting to get home to wash my hands and put the meat in a safe and closed container in the coldest part of my refrigerator. This meat was going to cook for a good, long time before it entered my mouth. I’ve had worse. I’ve had better. But I must admit that I was looking forward to finding a recipe that fit a home cooked goat meal. N.B The Great Goat Adventure 2 is up!